We’re continuing our series on DNA & Book of Mormon. 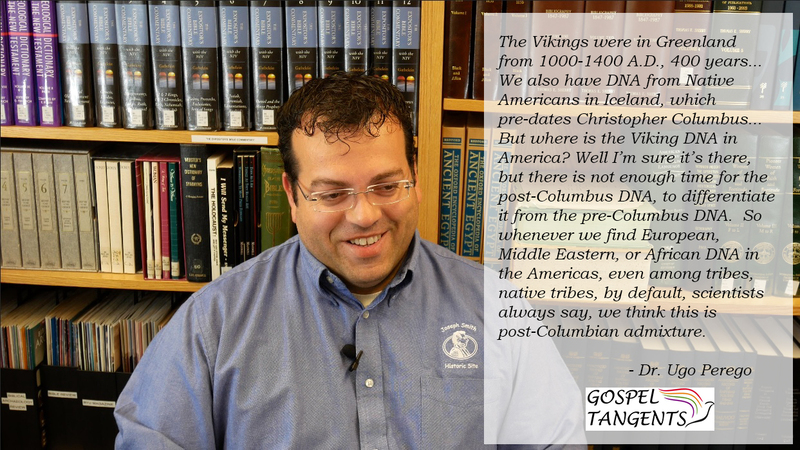 How to Lemba Tribe & Vikings DNA relate to the Book or Mormon? If you’ve listened to my interviews on the Book of Mormon, I’ve asked a few people, like Jim Vun Cannon and David Rosenvall about the Lemba Tribe in Africa. They’re a tribe that has Middle Eastern DNA, unlike Native Americans who don’t. Dr. Ugo Perego gives a good introduction into the Lemba Tribe, and why similar DNA is or is not found in America. Ugo: The Lemba Tribe is an African tribe. Traditionally they claim to have Jewish ancestry but physically they are African. They did this DNA study, this was done several years ago, and actually things have changed a little bit since then. The original thing that made a huge impact that people still remember is the fact that Jewish researchers identified a marker among Jewish families called the Cohen haplotype. Cohen is the priestly class. It’s a surname which is linked back in time of the Levi or Aaron, brother of Moses, and that would be the priestly class that was found among the different Israelite tribes. The first research says we identified these markers. It’s very dominant among the Cohen families which traditionally was the priestly family. They have the marker. The other families don’t have it as much as they do. Do all the Cohen people have the marker? No. Do people that are not Cohen have the marker? Yes, but the majority of the Cohens has it, so they are linking to them. It’s never 100%, it’s never all or none. They have it. We link it to Jewish families, we link it to the priestly class. Now the Lemba Tribe says we are part of the Jewish family too. They found the Cohen haplotype among them as well, so you think genetically it makes more sense. GT: Right. The story that I remember, it seemed to me, and correct me if I’m wrong. It seemed to me they kind of had a similar story as Book of Mormon people. They both left Jerusalem about the same time. Ugo: born Jew. They accept converts. What I think is that most of these Lemba thing could also be a result of a sort of a mixture, some sort of founder effect, but not much as a migration as much as they thought, maybe like a few people that came and had an interaction and then there was maybe this gene that spread. Another thing that they discovered, this is today’s knowledge. This marker is found among all of the Middle Eastern population, not just Jews. It pre-dates Aaron’s time. Arabs have it. Muslims have it. It matches other types of markers. It is not Jewish-specific or Jerusalem-specific marker. It’s a lot more spread and common than we think it is. It’s good. They did a study on a Jewish population. They did a study on another population, and they did find something in common between them. We’ll also talk a little bit about Viking DNA. Can that be distinguished from Columbus DNA? Ugo: Do you think we can determine DNA from 1800 versus DNA from 1000 A.D. from Europe found in America? GT: I would think so. Ugo: The answer is no. Do you know the Vikings were in Greenland from 1000-1400 A.D., 400 years? We have written documentation that they were here, the Icelandic woman actually kept their record of their voyages. We have villages, remains of Viking villages in Greenland that around 1400, they just left. They just left. We also have DNA from Native Americans in Iceland, which pre-dates Christopher Columbus, that’s been there. So we know probably these Vikings took some women to Iceland, and that’s why we have their DNA there. But where is the Viking DNA in America? Mitochondrial DNA, we actually measure one mutation every 5,000 years, mitochondrial DNA, which is one of the studies that have been done. So the point is we do find European DNA among Native tribes, but we always think that came with the Spaniards or with the Europeans. The first 200 years that they were here, they did whatever they wanted. So you go to a reservation and you test a hundred people, you find 60 of them that might have Native American DNA, and then you find 40 that have European DNA. You think, well, this is the Spaniard mixing with them. They kept culturally their identity, but genetically we don’t know. We don’t know where that came. 2,600 years ago is not enough time to differentiate DNA from Europe, from post-Columbian to pre-Columbian DNA. It took 15,000 years for DNA to slightly differentiate it from the Asian counterpart. Even today if you take a DNA test with Ancestry.com or with 23andMe or Family Tree DNA, they put Asian and Native American together in the same group, because they can’t make the differentiation. So if you find European DNA in a native group, you put it with Europe, but you think by default. In fact if you read any paper by any population scientist, they will not say, this is post-Columbian DNA. They say, most likely it is post-Columbian DNA, but we don’t know. Were you aware that scientists can’t distinguish between Viking DNA and Columbus DNA? Do you think it’s possible that the DNA from Lamanites simply can’t be distinguished? Check out our conversation…..